The Iron Giant is a Science Fiction movie starring Jennifer Aniston, Harry Connick Jr., and Eli Marienthal. The movie was directed by Brad Bird and released by the Warner Bros. Feature Animation studio on 1999-08-06. The movie has an MPAA Rating of PG (Parental Guidance). Our users found the overall impression of this film to be Exciting. The movie's official site can be found at www.irongiant.com. My favourite part was when Hogarth is on the toilet trying to hide the Iron giant from his mum. I like the movie because it has some more funny bits such as when dean is making the Iron Man do arts and crafts. I did not like it when Hogarth called the Iron Giant a baby because it is rude. I would recommend it to big or small and old people .and my stars is 9/10. The start of the movie has the Iron Giant smashing on the sea ground. There is a little boy called Hogarth he caches a squire and asked if he can bring it home. Then it goes up a man called Dean’s pants. Then Hogarth see’s the Iron man getting……(your have to watch the movie to find out). I like this part because the Iron man is getting electrocuted by power switch. This movie company who has made the movie, is one of the best of them all. Because they never do anything wrong they have the best animations and the best character description and their writer’s never do anything wrong. Children under 4 years old should not watch the movie. Children under 12 watch it. But over 12 can make up their own mind I meant that I give it 10/10 star’s just kidding everyone should watch it. This classic book by Ted Hughes and illustrated by Andy Davidson is good. I like the book because it has the Space-Bat-Angel-Dragon and the Iron Man. I like the book better because it leaves you hanging. I like the book better because it describes and helps you make a better picture in your head. Also the book is more interesting than the movie. The Iron Giant is a friendly giant who saved people. It all starts with Hogarth catching a squirrel. He meets Dean drinking coffee. I like the movie because it has wonderful cartoon pictures. Hogarth suddenly saw the Iron Giant standing in electricity and they have an adventure. I would recommend this for everyone because it’s nice and scary. A movie that I have just watch is by Tim McCanlies called The Iron Giant. I like it because it is less work than writing a book. My favourite part was when the army try to kill the Iron Giant. I did not like it when agent ken try’s to explode the city. I would recommend this movie for 6 or over. The characters are amazing. You have got the brilliant Iron giant, Hogarth, Mum, Dean KEN and the army. The movie is a lot better because it has funny dialogue makes you laugh all the time. I did not like it because ken tried to kill the iron giant. I would recommend the movie to all people. It is classic movie. You won’t be able to stop watching. I give it 10/10 stars as it will leave you hanging and is timeless. The movie is called the Iron Giant it starts with Hogarth meeting his mum and dean. 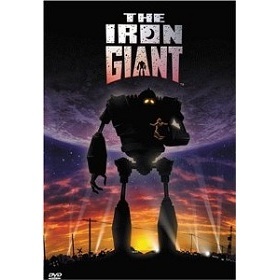 I like this movie because Hogarth teaches the Iron Giant. I did not like this movie because the Angry Framers tried to kill the Iron Giant. I would recommend this movie because it's so fantastic. The Iron Giant is a fantastic movie because it has good animation and the storyline is fantastic and funny. I liked it when the squirrel went up Deans pants. I would recommend it to children of all age because it’s more creative and I think adults might get bored. This enchanting movie is by Brad Bird and written by Tim MaCcanlies. The movie is good because there’s good dialogue and good action. The Movie is about a boy named Hogarth who went to the canteen where his mum worked because he wanted to show his mum his pet but it was gone! The movie leads you into an imaginative world where you can see all the creative things in the story. Hogarth (A boy) met a man called Dean. This was a bit funny. He asked if was near him ………. Hogarth met a creature called the Iron Giant and he decides to be friends with him. The movie was much better than the book. I think it’s better because it’s got more action and speech. Trust me you would not stop watching it. The book was actually rubbish. I would recommend the movie because it’s got creative things in it. This movie would be for the age of 7 and over because people under 7 might get scared and their parents might be really annoyed when they watch it. Because this movie is really enchanting I would give it 5 out of 5. This enchanting movie Iron Giant was directed by Brad Bird it stars Jennifer Aninston, Harry Connick, Vin Diesel, Eli Marienthal. I loved watching this, movie it was one of the best I have watched. The end is the best when he saves the…..……..( I am not going to tell you have to watch it yourself I don’t want to spoil it for you) ken Mansley is evil watch the movie to find out how evil he is. The best characters are Dean and Hogarth there classic. This film is very funny indeed. The start of the story was all right but then slowly and surely it got enchanting. The best part was when the…..( I am not going to tell you have to watch it I don’t want to spoil it for you) but when you watch this movie make sure you fill your house with popcorn, because it makes you not be able to leave your room for a snack make sure you remember that ok. I would recommend this enchanting creative story for 5year olds and up because younger people might get scared. I am not saying they will but they might you never know. If I am going to rate this out of 100 I would give it 99/100 for real. I’m only giving this 99/100 because Ken Mansley was evil and that’s what spoiled it for me. But I would give it 5out of 5 stars You will love this I am sure.